HMNZS Southland was commissioned into RNZN service on 21 December 1983. She along with HMNZS Wellington would replace HMNZS Otago and Taranaki. Southland carried out a range of duties including exercises, ceremonials, and maritime rescues. In 1992 Southland participated in Operation OCTANUS. This was a joint MAF/Police operation against paua poachers based in Bluff. 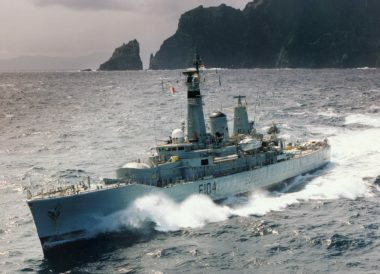 The Leander-class frigate was an early 1960s development of the Rothesay and Whitby-class frigates such as the Otago and Taranaki. Southland was constructed at the Yarrow & Co shipyard in Glasgow. She was laid down on 2 December 1959, launched on 22 December 1961. She was originally laid down as a Rothesay-class frigate to be named HMS Hastings then changed to HMS Dido and she was commissioned into the Royal Navy on 18 September 1963. The ship’s company that had decommissioned HMNZS Otago were transferred to the Southland. In 1975, HMS Dido was the ship used to make the television series Warship. Her pennant number was changed to F42 and she was named HMS Hero for the series. In 1978 she went in for a major refit. The twin gun turret was removed and replaced with the Ikara AS missile system. On 18 July 1968 HMS Dido was transferred to the Royal New Zealand Navy and renamed Southland. The next day she was sent to the Vosper Ship Repairers yard at Southampton for a refit before she entered RNZN service. HMNZS Southland was commissioned into RNZN service on 21 December 1983. She along with HMNZS Wellington would replace HMNZS Otago and Taranaki. HMNZS Southland carried out a work-up with the Home Fleet and departed Southampton on 9 May 1984 sailing to New Zealand via the East Coast of the United States, Panama, Pearl Harbour arriving at Auckland after stopping at Bluff and Wellington on 26 July 1984. 1988 she went into the dock at Devonport for a limited dockyard refit. Once in service, Southland carried out a range of duties including exercises, ceremonials, and maritime rescues. In 1992 Southland participated in Operation OCTANUS. This was a joint MAF/Police operation against paua poachers based in Bluff. On 1 March 1995, HMNZS Southland was paid off from RNZN service and in November 1995 she was towed to the Philippines to be broken up. November returns to Sydney for more exercises. April Sails to Sydney with HMNZS Canterbury for more exercises.